Excerpt from a performance / presentation during the event entitled What Might a Radical Arts Institution Look Like in Bergen? at the Partisan cafe, 5th September 2016. When I moved to London to study Music Technology, it was partly just to move somewhere new, and partly because it seemed like it might be a good way to develop my life's mission. That's a very simple way I have of looking at it now, but it wasn't a very clear mission at the time, I just know that I wasn't interested in trying to pursue any specific career. I wanted to do something meaningful, something cultural, and something that challenged the whole pessimistic mantra of "Get a good education, get a good job, work systematically towards 'realistic' goals, and eventually you will own enough resources to do what you like 'within reason'". Within a few years I was ensconced in a squatter milieu, decorating exotic locations for various events, with psychedelic backdrops, film loops and other installations. It was soon clear to me that what I really wanted to do, was to travel around the world, ideally in a van, getting into spontaneous adventures whilst making some kind of documentary film about it all. It turns out that this is a very common ambition among young men. My mum told me about an interview with a travelling dance group that were looking for an apprentice lighting guy. I got the job, and spent two years traveling all around Europe and North America, while filming for what became a 22 minute film of landscapes set to music, entitled Feet, Hands and Head Through A Collage of Landscapes. I even received a grant from the Princes Trust, which paid for all my materials. We had some adventures during that time, but it was a lot of hard work too, and it never occurred to me that, in many ways, I had achieved my goal of travelling around (at least some of) the world, and making some sort of film. It took a close friend of mine to point this out, and although I was sort of pleased that he thought so, by that time my ideas had developed, and I didn't actually agree with him that I had realised my plan. The company I had been touring with had three different shows: one for small kids, one for older kids, and one for adults. All these shows could be tailored to suit different sized venues, and when we toured in Europe, we had our own buss with our own lighting rig, so we could offer a very flexible program to suit different schools and theatres. The shows contained Eurhythmy, which is a movement vocabulary connected with the philosophy of Rudolf Steiner and Steiner pedagogy, so we were also able to connect with Steiner networks, which made it easier to find audiences, theatres and places to stay. Having seen how this group worked, it was clear to me that I wanted to develop a show that would really connect with people, that could adapt to suit different situations, and develop as it went along. I saw the importance of finding good collaborators with whom I could exchange ideas and skills. These could be people that were part of my show, or they could have their own work to show. I would put together a travelling community of artists, musicians, mechanics, cooks, doctors, masseurs, lawyers, IT consultants and documentary filmmakers. We would travel together, inspire and take care of each other. When we reached a destination, we would establish something like a fairground, where people could come and see our film program at our open-air cinema, buy food and drink from our kitchen, come to our performances and concerts... Musicians from our group would of coarse perform in other venues around town. Maybe my theatre show would be staged at a local theatre sometimes. In countries with poor healthcare, our doctor would have an open clinic. It would be inspiring and educational for him to travel, and to treat people in different situations. He might even arrange to visit interesting institutions and medical professionals from different practices. It would be likewise inspiring and educational for a lawyer. After all a lot of people have these utopian ideas when they're young. Maybe some of them end up taking some practical advice and becoming lawyers? In fact I met one on a Green Tortoise tour in Mexico, and he visited me later in my squat in London - so I'm pretty sure it could happen! People would come and go. Sometimes up to several times. They would have children. This might make them want to settle down somewhere, but we would have a great community school! Think of all those engaged and inspired people in our crew! Imagine what a great education it would be just to see how everything developed as our traveling fairground (or festival) adapted and established it's self in different places across Europe, then into Russia or the Middle East, and on into Asia. There we would build a ship and become an autonomous, international community. No longer tied to any state other than our own. We would provide a floating school for children recued from conflict zones and other unfortunate circumstances. We would have our own media channel. Subscribers would be like an extended part of our community. 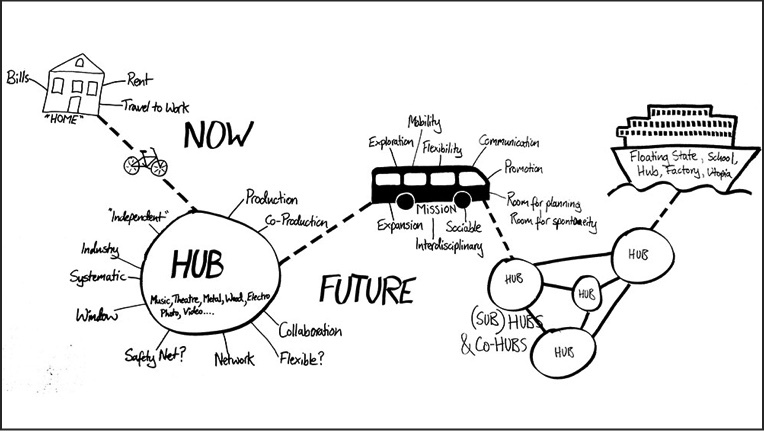 We would develop networks of likeminded institutions, venues and art centres. We would build and distribute stuff along ethical, fair trade principles. It's been hard for me to get the ball really rolling with this project. I didn't just want great work to show. I also wanted to develop my skills within various creative practices such as audio-visual production, electronics, wood and metalwork, as well as performing and compositional skills. To do this, I needed access to equipment, and exposure to other artists. Since a lot of other people find themselves in the same situation, I figured that I could just start an art centre that would provide the right environment, and it did! Most people understand that a good city to live in should have a few art centres. Art centres can function in a lot of different ways, and they can be staffed in a lot of different ways. But to function well, they demand a lot of loving attention. It's not uncommon for artists to establish art centres, and develop them into something cool, before spreading their wings and handing the administration over to professional administrators. In cases like this, the artist can provide a useful ambassador role, making interesting and useful connections with other artists and institutions. Other art centres and institutions may be initiated in response to particular cultural interests or demands, and may be led purely by administrators. Whatever the case, the institution is about more than one individual. It's a point of interaction between art and society. Now that there are quite a few institutions in Bergen, it seems less likely that anyone would want to start a new one. I'm sure it would be significantly harder now than it was when Wrap started. But our new institutions should be more than static symbols of the way we worked in the naughties and twenty-ten's. We already have the grand state institutions from the nineteenth century to show us that kind of cultural heritage. Our new institutions should be in a constant state of renewal and rethinking. They should be accessible and receptive to new artists, new audiences, new practices and new ways of thinking. Leo Preston is an interdisciplinary artist with roots in the performing arts. He is also co-founder and artistic director of Wrap arts centre in Bergen. Through Wrap he has initiated various projects with a particular focus on complex modes of collaboration, progressive approaches towards intellectual property and inclusive curatorial strategies. In his many collaborations with local and international artists, he has taken the role of performer, musician, lighting designer and scriptwriter. He is also known for his own contemporary theatre productions, which have appeared in many of BIT-Teatergarasjen's festival programs over the years.